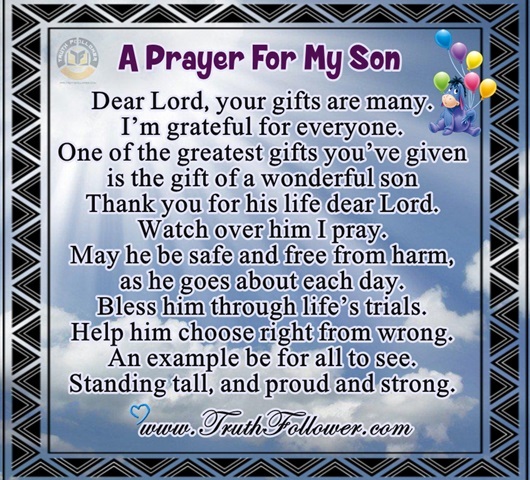 Dear Lord, your gifts are many.I’m grateful for everyone.One of the greatest gifts you’ve given is the gift of a wonderful son Thank you for his life dear Lord.Watch over him I pray.May he be safe and free from harm, as he goes about each day. Bless him through life’s trials. Help him choose right from wrong.An example be for all to see.Standing tall, and proud and strong. I will always need my Son, no matter what age I am. My son has made me laugh, made me proud, made me cry, seen me cry, hugged me tight, seen me fail, cheered me up, kept me on my toes, and at times driven me crazy, But my Son is a promise that I will have a friend FOREVER! A Prayer For My Son picture/image is an Inspirational Stuff to Inspire and Motivate You. You can download pics by just clicking on the Images. Thanks for visiting Truth Follower an online place for huge collection of inspiring pictures, quotation, and Sayings Images. If you like A Prayer For My Son, Please Share with friends and family on Facebook, Twitter, and Pinterest.